In August 2015, Bob and I celebrated our 40th wedding anniversary so we wanted to further mark the occasion with a memorable trip. 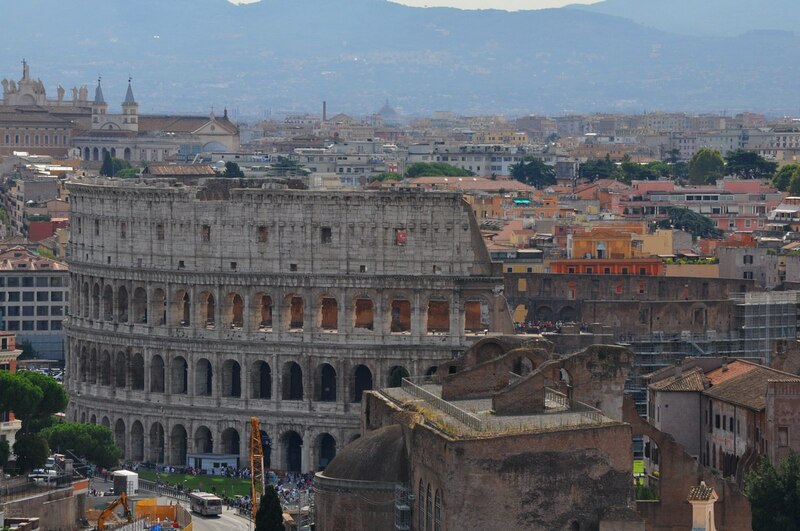 Never having visited Italy, we figured that a jaunt to the city of Rome would be a good place to start our 3-week vacation. After all, it is considered amongst the top ten romantic cities in the world. We were really looking forward to discovering for ourselves the sense of history embodied in Rome’s centuries-old architecture, but beyond the capital city, our trip would take us to Florence , Pisa, Cinque Terre, Tuscany, and Venice , and seeing as we are outdoors people who enjoy wilderness settings, two national parks as well. 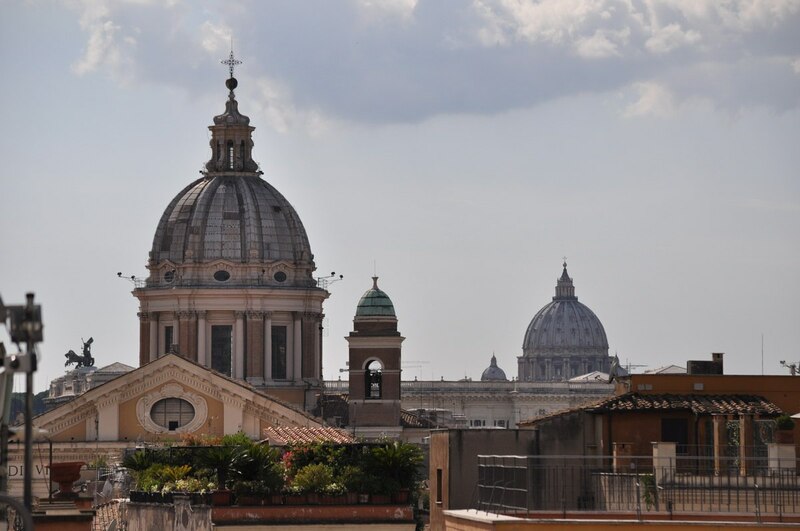 We were poised to begin exploring the old quarter of Rome by 3 p.m. in the afternoon on our day of arrival, with our hotel centrally located near a number of scenic spots such as Piazza del Popolo and the Spanish Steps, seen above. We were in dire need of a walk after the 8-hour flight and several hours of other travel time. 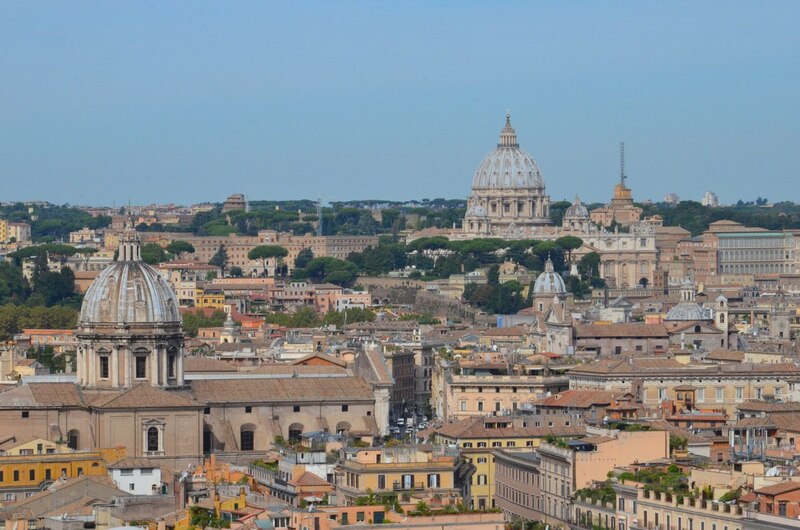 Rome is a bustling city so filled with imposing architecture, masterpieces of art and ancient history that we had to allot our time wisely in order to take in the most significant attractions in the 5 days we had for exploring the centro storico or historic centre. 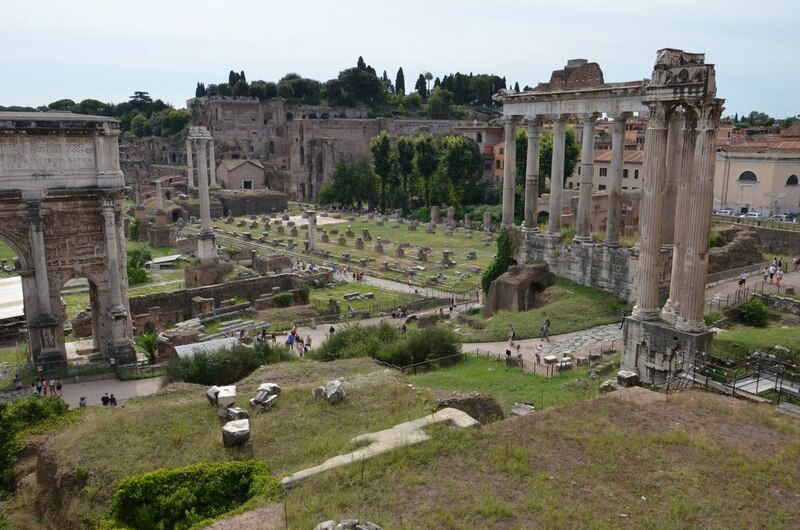 First up was the Roman Forum. Bob is a history buff and had refreshed his knowledge of Roman history in the weeks leading up to our trip, so he was able to brief me on the amazing ruins that had us both in awe. 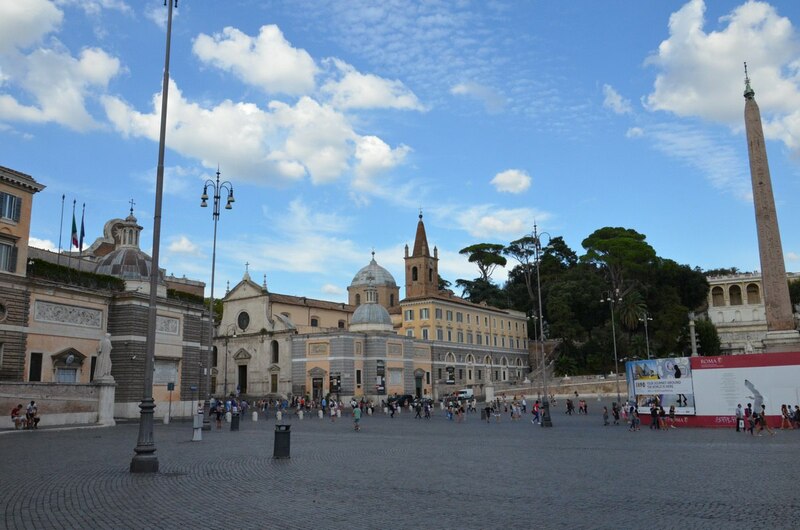 To arrive at the Roman Forum, Bob and I took the subway and emerged above ground at Piazza Venezia. Overlooking and dominating the piazza is the most massive monument that I have ever seen. 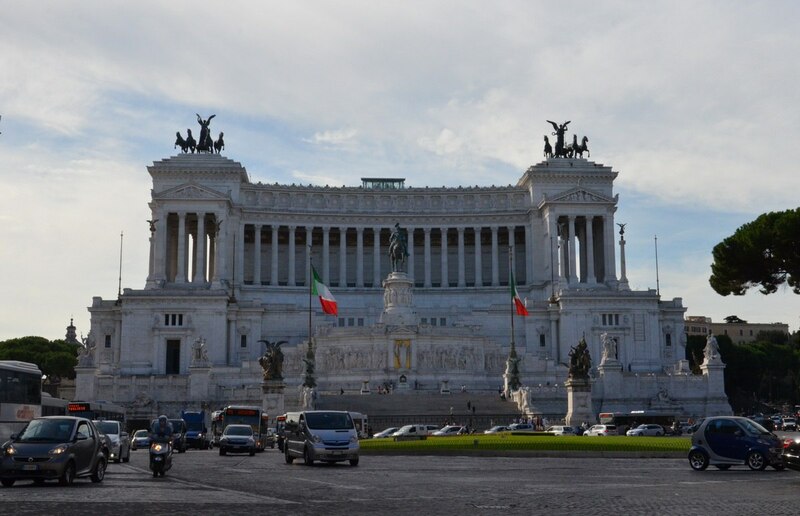 Known as Monumento Nazionale a Vittorio Emanuele II, its shortened name, Il Vittoriano, still enlightens visitors as to the honour bestowed upon the memory of Victor Emmanuel, the first king of a unified Italy. From Piazza Venezia, the central hub of modern-day Rome, we walked to what was once the hub of public life in ancient Rome, the Roman Forum. Our first vantage point allowed us to have an overview of the sprawling ruins that are replete with columns, arches and a vast array of other architectural fragments. I was in heaven and eager to soak up the history surrounding the ancient space. 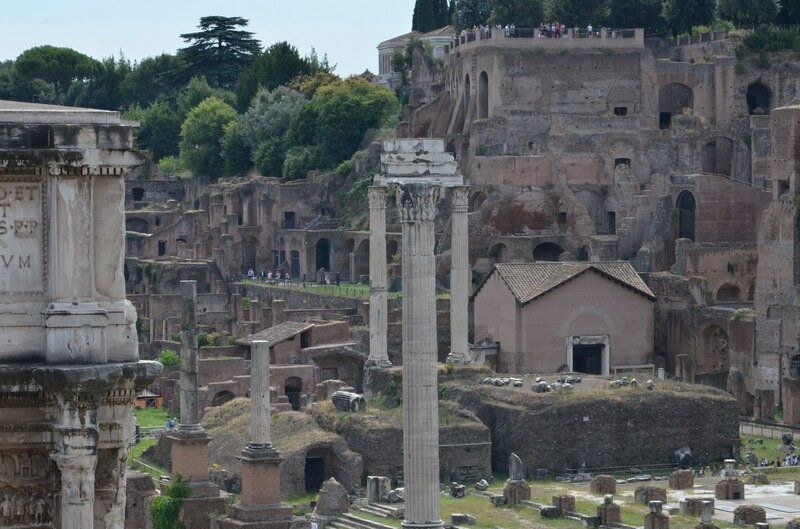 Our walking tour took us next to Palatine Hill above the Roman Forum. 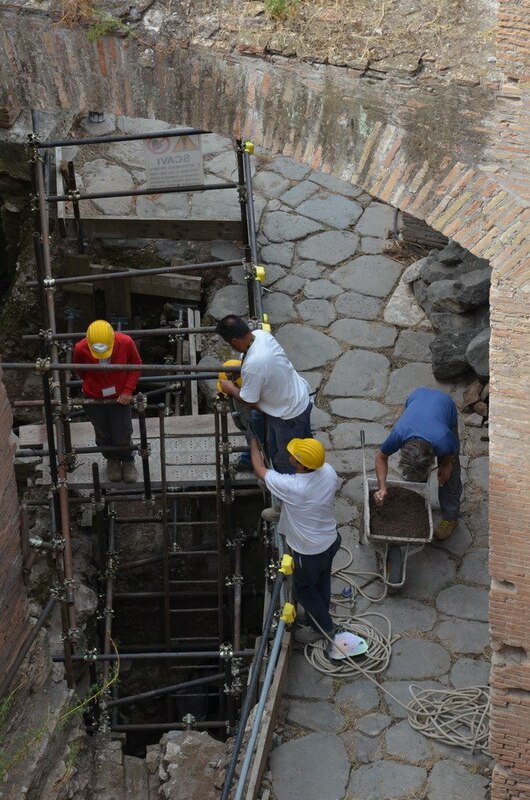 One of the Seven Hills of Rome that fell within the ancient walled city, Palatine Hill was encircled by the other six. Even as we toured the scattered ruins there, we were witness to ongoing excavations, some of which have revealed habitation on the site from as early as 750 BC. 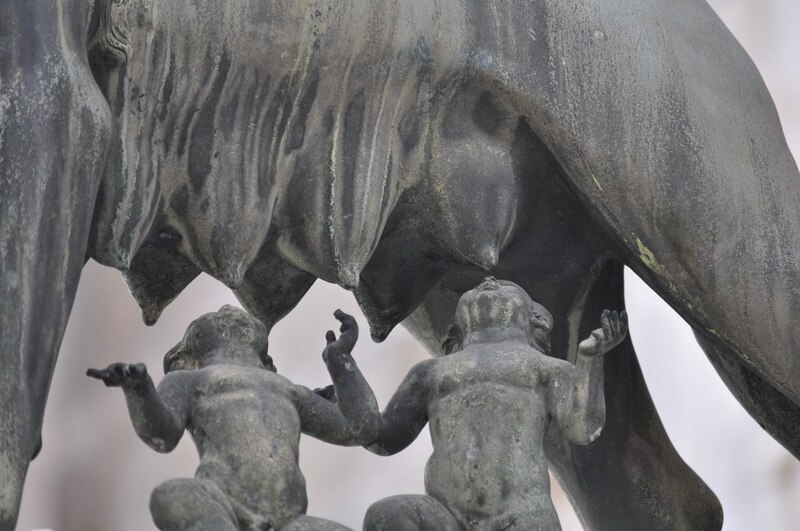 In and around the city were statues that nod at the mythical legend behind the founding of Rome by portraying Romulus and Remus, twin brothers of royal blood that were forced into abandonment and subsequently suckled by a wolf. 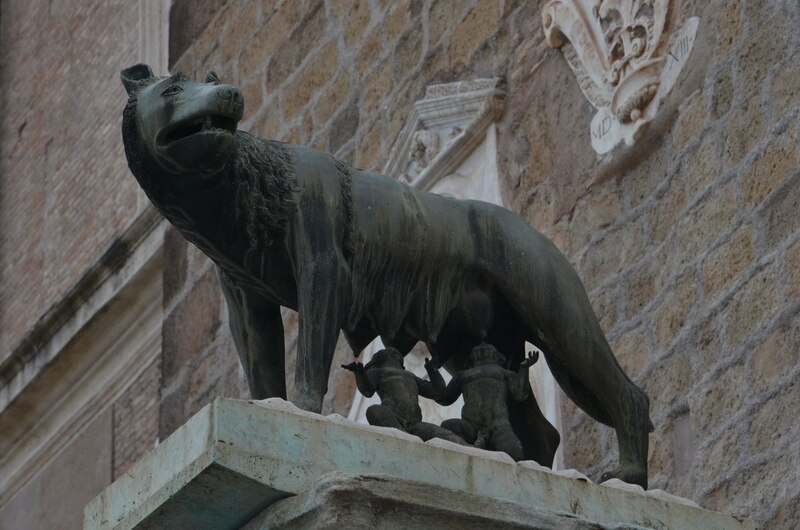 As the legend goes, eventually Romulus and Remus were rescued and fostered by a shepherd and his wife, and they grew up as shepherds until they realized their birthright and were able to restore their grandfather to power. It was at that point in time that the two brothers decided to found a new city of their own. Romulus’s preference for Palatine Hill as the best location was substantiated by the reading of omens, a fight ensued, and Remus was killed. 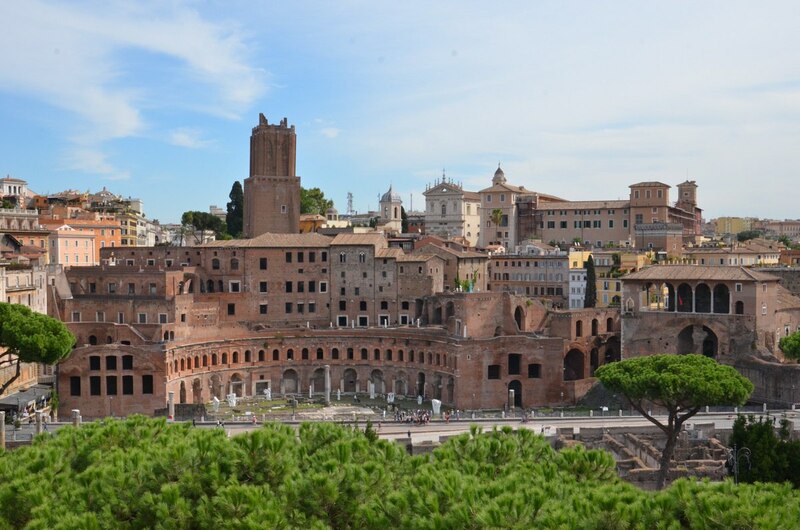 Thus, the new city assumed the name Rome. Of course, one of the must-see buildings in Rome is The Colosseum, and we headed there on the second morning of our stay in the Old Quarter. 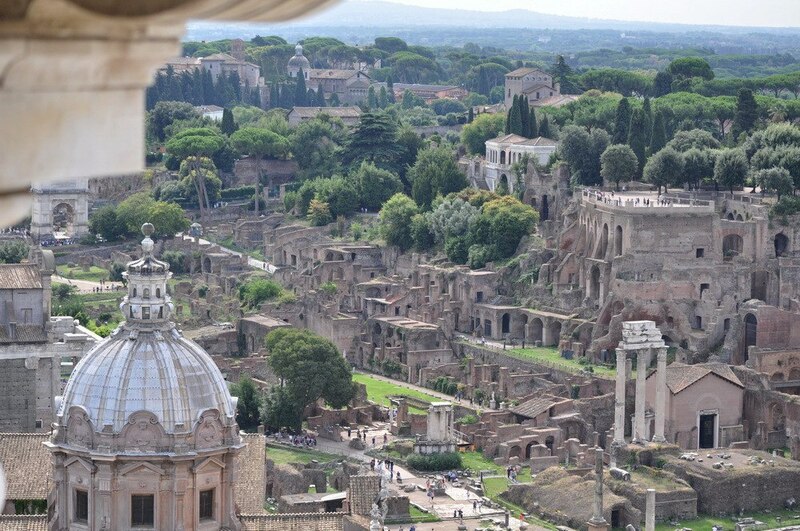 The view seen above was from the Roman Forum the day before and tantalized our expectations. 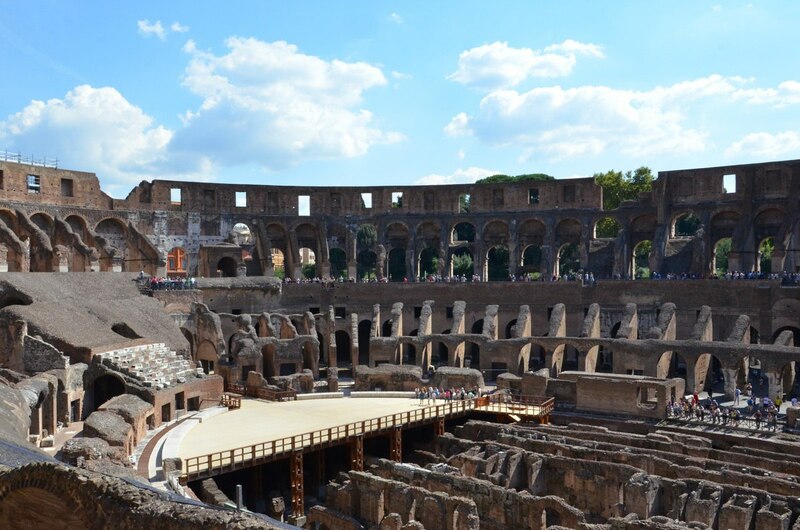 For me, The Colosseum is the iconic representation of the once-dominant Roman Empire encapsulated in the feats of engineering and construction that produced this architectural wonder. 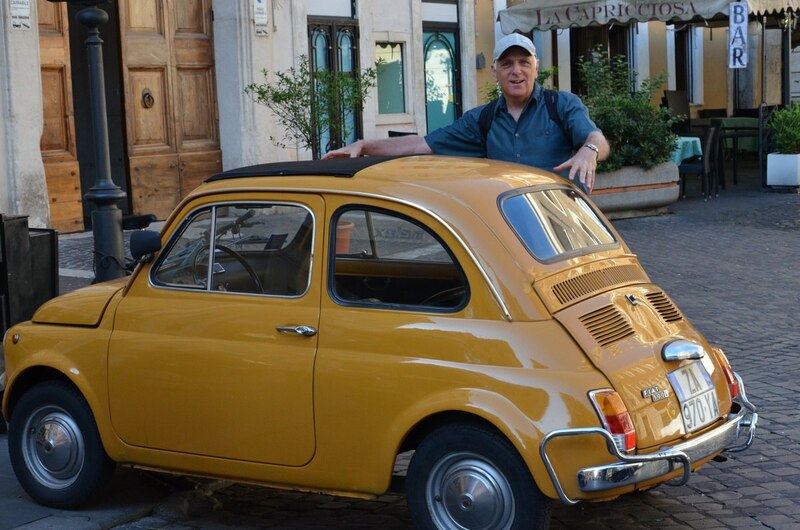 I would be remiss if I did not mention the glee inspired in Bob and me by the sight of miniature cars the likes of which we have never seen at home and the hordes of scooters that ply the streets of Rome. The cobblestone lanes are so narrow that these vehicles are an absolute necessity. As it is, there is barely room in many of the thin alleyways to even accommodate a car such at that seen above. Reminding me of the artistic district in Montmartre in Paris , the conglomeration of artists at the top of the Spanish Steps featured those who paint portraits, caricatures, street scenes and landscapes. It was a scorching 28 degrees Celsius as we perused their offerings, so an umbrella might have come in handy for some extra shade, but as it was, I had to do with my sunhat and sunglasses. 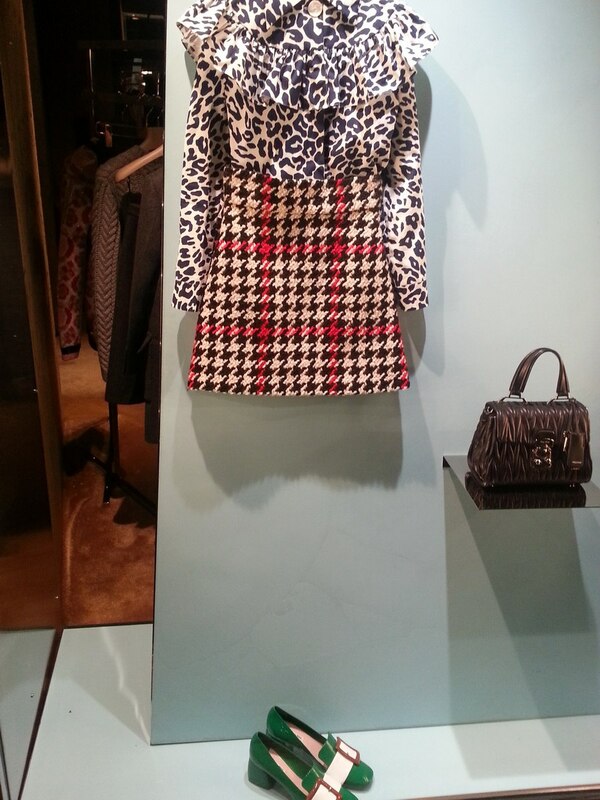 The proliferation of designer boutiques in and around the tourist districts had on offer some of the most avant garde fashion that I have seen anywhere. It was a far cry from those garments that I observed on the pedestrian traffic, but even the fashion sense exhibited by most tourists had me marveling at the vast array of styles that had come together from around the world. 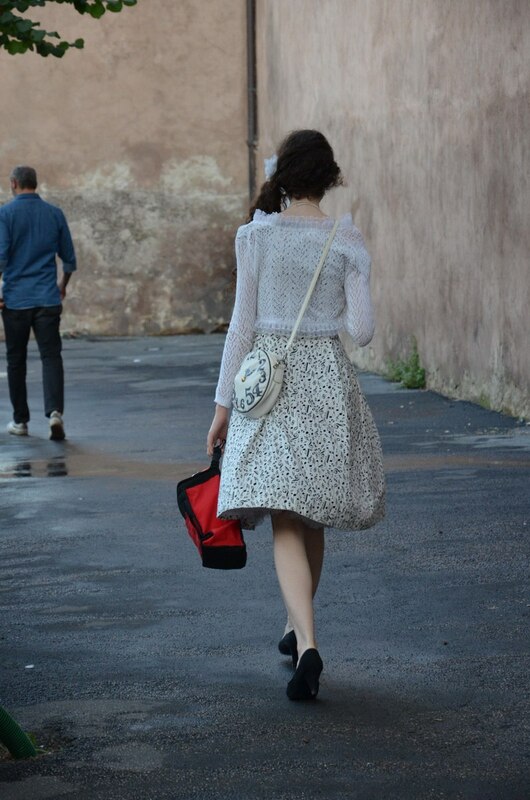 One evening, as Bob and I completed our walk along the Tiber River, we witnessed this young lady as she emerged from her parents’ auto. The whimsical flare of her purse and crisp white dress bedecked with a jumble of black musical notes and symbols alluded to her playful nature, whereas the sheer lace sweater and simple black pumps betrayed a sense of practicality that even her jaunty hairstyle defied. She was destined for some rendezvous and quickly disappeared into the shadows of a subway platform. Bob and I do not go very far before we start taking note of any new wildlife that might cross our paths. 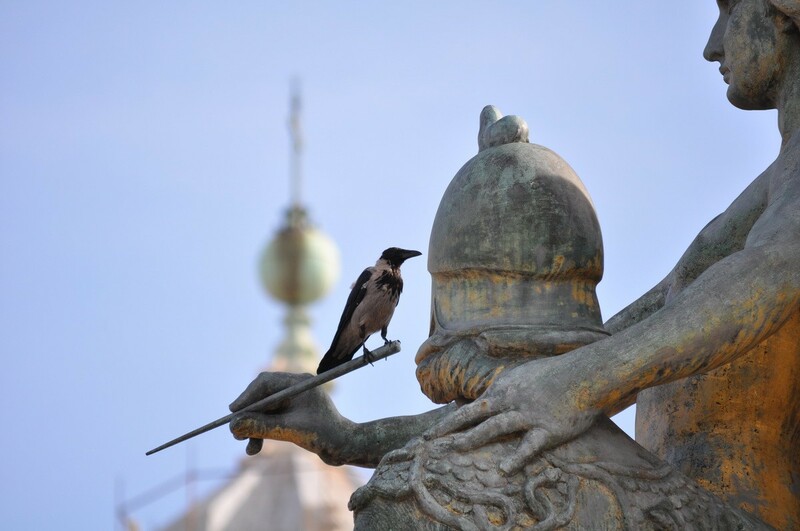 As we explored the Old Quarter, it was Bob who first drew my attention to a Hooded Crow (Corvus cornix) where it was making use of a marble stylo for a perch on one of the many statues at Il Vittoriano. 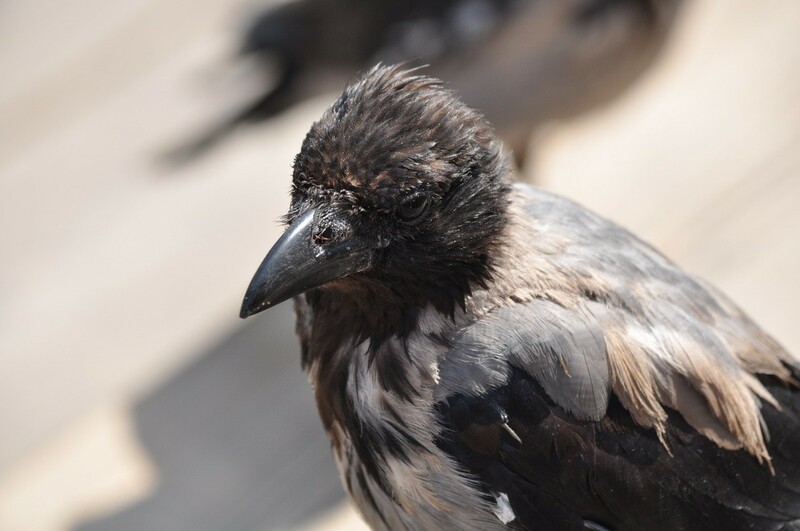 We came across Hooded Crows just about everywhere in Rome and had to wonder whether or not they are as clever as the American Crows that hang around our neighborhood at home. 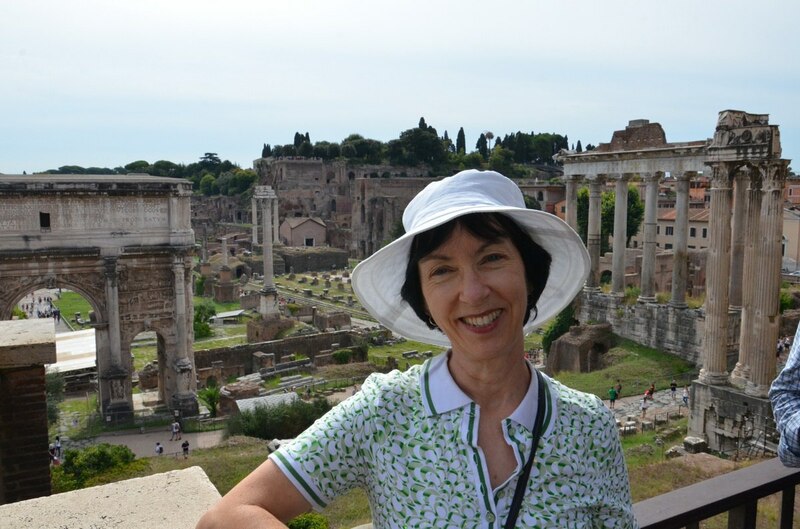 As we toured another set of ruins, Trajan’s Market, I became aware of the musical strains of some Italian ballad before I actually pinpointed a gentleman set off to one side peacefully pumping his accordion while couples strolled by hand-in-hand. Street musicians popped up often and made a delightful addition to the experience of sightseeing or dining, while others injected a sense of humour into our day when role-playing as jovial Centurions. 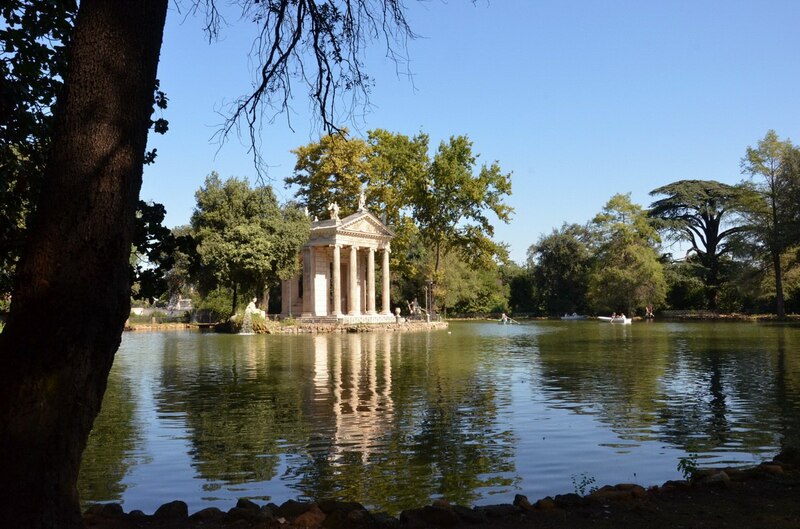 We covered countless kilometres while walking the streets of Rome and investigating every aspect of the various landmarks, so one morning, to ease the strain on our knees and hips from having pounded the uneven and unforgiving cobblestones, we visited Villa Borghese Park about a 20-minute walk from our hotel. The extensive green canopy, myriad fountains, woodland paths, ancient statuary and even a small lake combined for a restful respite from the crush of tourists elsewhere. 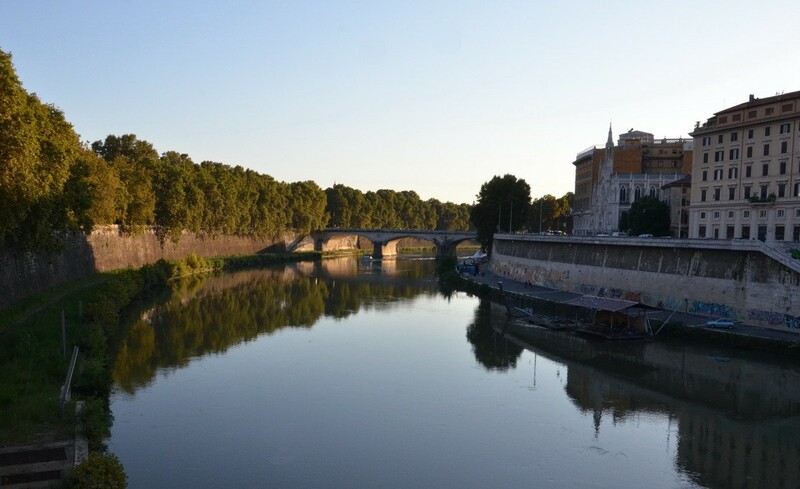 One evening, after a sumptuous 4-course meal overlooking Piazza del Popolo, Bob and I crossed the square in the direction of the Tiber River. Our stroll along its banks had us soaking up the late-day sunshine that cast a lovely glow over the wide river and illuminated the arches of a distant bridge while a row of stately trees was mirrored in the calm surface of the water. 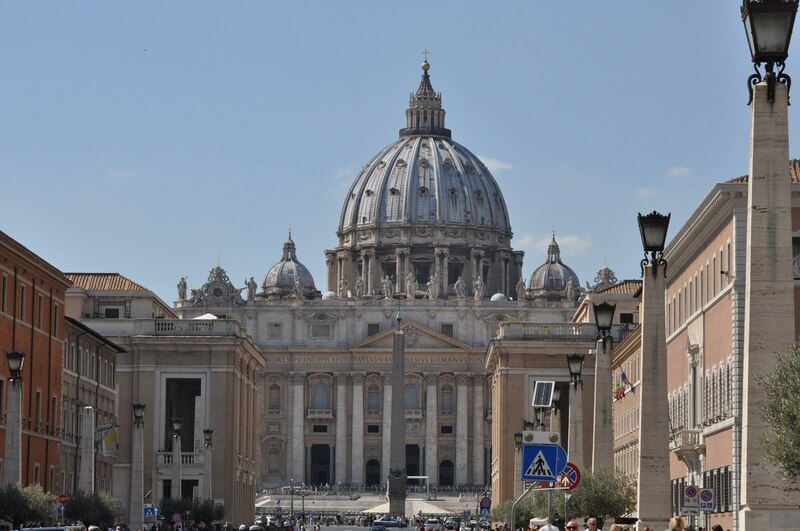 No visit to Rome would be complete without a stop at Vatican City. 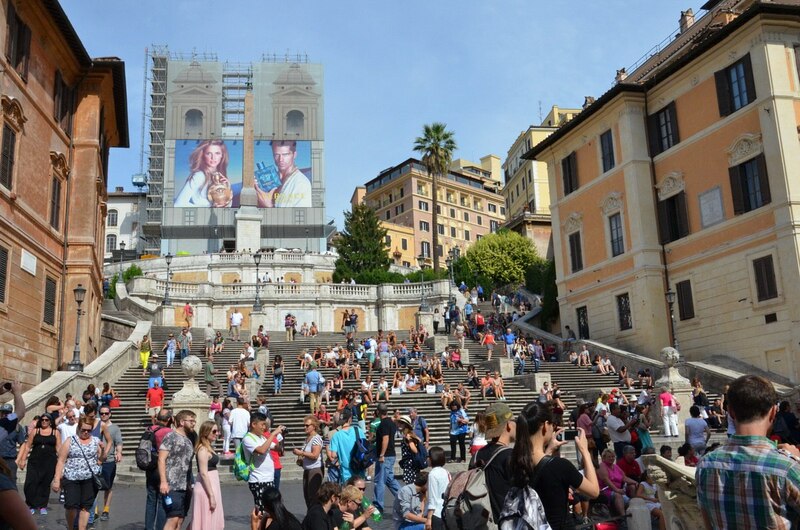 A taxi quickly navigated through the narrow streets to drop us near Piazza San Pietro or St. Peter’s Square. 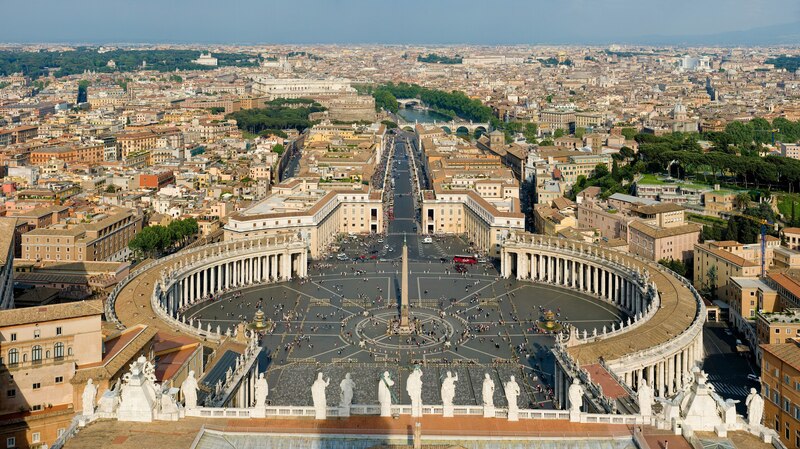 Even the first view we had of St. Peter’s Basilica, seen along the length of Via della Conciliazione and embraced by Bernini’s colonnade, revealed itself as one most impressive representation of territorial sovereignty found anywhere in the world. 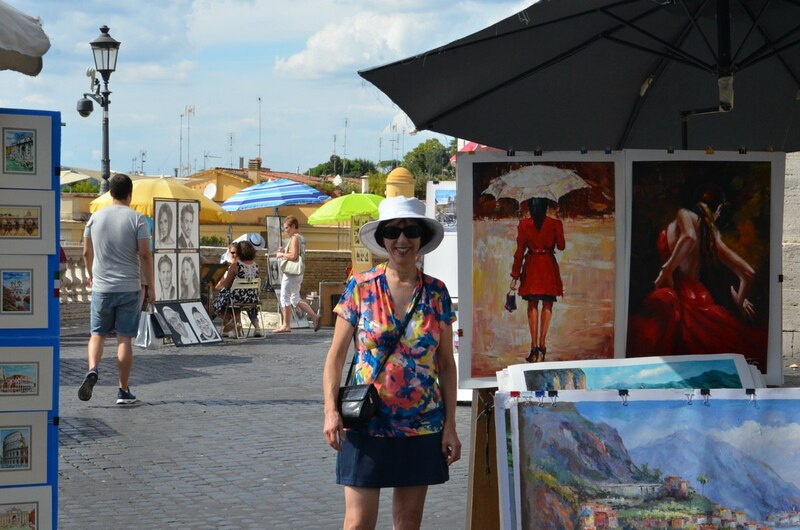 Our last evening in Rome saw Bob and me wandering over to Piazza del Popolo once again where we took pleasure in people watching and observing the vigorous endeavours by street vendors to hawk novelty items or long-stemmed roses to passersby. As the sun dropped lower in the sky, we sauntered up the Pincio or Pincian Hill to take in one of the greatest views overlooking Rome. 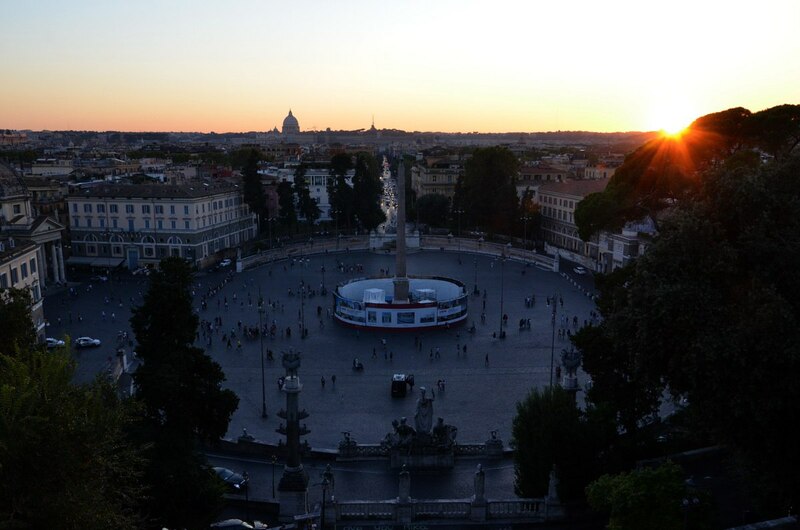 A lovely sunset marked the end of our stay in Rome. As the piazza withdrew into the shadows, St. Peter’s Basilica stood bright against the darkening sky. It was a very memorable moment.